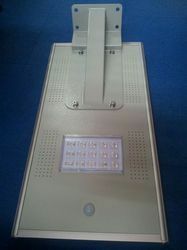 Providing you the best range of 100 watts all in one solar led street light, 9 watt all in one / integrated solar street light, 60 watts all in one solar street light, 40 w aio / all in one solar led area light, all in one solar street light 25 watts and 12 watt all in one solar powered street light with effective & timely delivery. 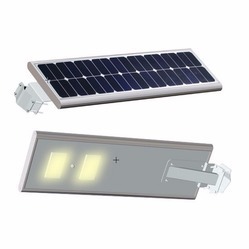 Light: 9 WattLamp Source: W-LEDLED Make: Cree, Addison, PhilipsSolar Panel: 25 Watt (Polycrystalline)Battery: 10Ah (lithium-ion)Working Temperature: -10°C to + 55°CDuty Cycle/Operation: DUSK TO DAWNLight coverage: 120 DegreeRated Lamp life (Average): 50,000 HoursConverter efficiency: > 90%Protections : Short Circuit and overload at load, Reversepolarity of battery and panel, Reverse current flow from batteryto panel, Battery high voltage protection and lightningprotection in panel circuit. 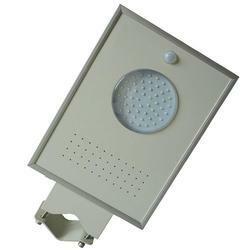 Lamp Source : W-LEDLED Make : Cree, Addison, PhilipsSolar Panel : 120 Watt(Polycrystalline)Battery : 48Ah(lithium-ion)Working Temperature : -10°C to + 55°CDuty Cycle/Operation : DUSK TO DAWNLight coverage : 120 DegreeRated Lamp life (Average) : 50,000 HoursConverter efficiency : > 90%Protections : Short Circuit and overload at load,Reverse polarity of battery and panel, Reversecurrent flow from battery to panel, Battery highvoltage protection and lightning protection inpanel circuit. 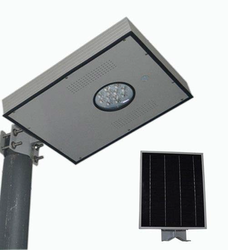 Light : 40 Watt Lamp Source : W-LED LED Make : Cree, Addison, Philips Solar Panel : 100 Watt(Poly crystalline)Battery : 35Ah(lithium-ion)Working Temperature : -10°C to + 55°C Duty Cycle/Operation : DUSK TO DAWN Light coverage : 120 Degree Rated Lamp life (Average) : 50,000 Hours Converter efficiency : > 90%Protections : Short Circuit and overload at load,Reverse polarity of battery and panel, Reverse current flow from battery to panel, Battery high voltage protection and lightning protection in panel circuit. 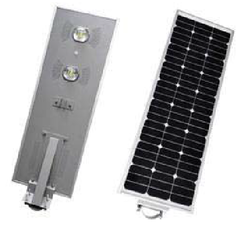 Light : 25 Watt Lamp Source : W-LED LED Make : Cree, Addison, Philips Solar Panel : 75 Watt(Poly crystalline)Battery : 25Ah(lithium-ion)Working Temperature : -10°C to + 55°C Duty Cycle/Operation : DUSK TO DAWN Light coverage : 120 Degree Rated Lamp life (Average) : 50,000 Hours Converter efficiency : > 90%Protections : Short Circuit and overload atload, Reverse polarity of battery and panel,Reverse current flow from battery to panel,Battery high voltage protection and lightning protection in panel circuit. 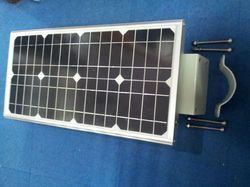 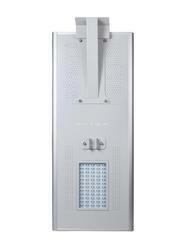 12 Watt all in one solar powered street light. 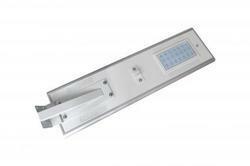 Light : 30 WattLamp Source : W-LEDLED Make : Cree, Addison, PhilipsSolar Panel : 75 Watt(Polycrystalline)Battery : 25Ah(lithium-ion)Working Temperature : -10°C to + 55°CDuty Cycle/Operation : DUSK TO DAWNLight coverage : 120 DegreeRated Lamp life (Average) : 50,000 HoursConverter efficiency : > 90%Protections : Short Circuit and overload at load,Reverse polarity of battery and panel, Reverse currentflow from battery to panel, Battery high voltageprotection and lightning protection in panel circuit. 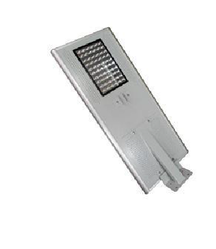 Light : 50 WattLamp Source : W-LEDLED Make : Cree, Addison, PhilipsSolar Panel : 100 Watt(Polycrystalline)Battery : 40Ah(lithium-ion)Working Temperature : -10°C to + 55°CDuty Cycle/Operation : DUSK TO DAWNLight coverage : 120 DegreeRated Lamp life (Average) : 50,000 HoursConverter efficiency : > 90%Protections : Short Circuit and overload atload, Reverse polarity of battery and panel,Reverse current flow from battery to panel,Battery high voltage protection and lightningprotection in panel circuit. 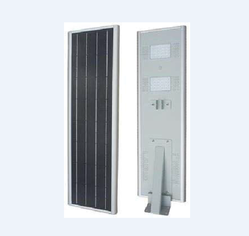 Light : 12 Watt Lamp Source : W-LED LED Make : Cree, Addison, Philips Solar Panel : 45 Watt(Polycrystalline)Battery : 15Ah (LiFePo4)Working Temperature : -10°C to + 55°C Duty Cycle/Operation : DUSK TO DAWNLight coverage : 120 Degree Rated Lamp life (Average) : 50,000 Hours Converter efficiency : > 90%Protections : Short Circuit and overload at load, Reverse polarity ofbattery and panel, Reverse current flow from battery to panel, Batteryhigh voltage protection and lightning protection in panel circuit. 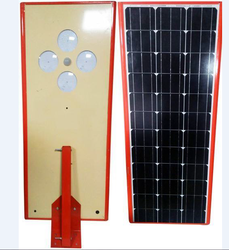 Protections : Short Circuit and overload at load, Reverse polarity of battery and panel, Reverse current flow from battery to panel, Battery high voltage protection and lightning protection in panel circuit. 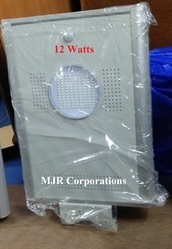 Light : 18 WattLamp Source : W-LEDLED Make : Cree, Addison, PhilipsSolar Panel : 75 Watt(Polycrystalline)Battery : 20Ah(lithium-ion)Working Temperature : -10°C to + 55°CDuty Cycle/Operation : DUSK TO DAWNLight coverage : 120 DegreeRated Lamp life (Average) : 50,000 HoursConverter efficiency : > 90%Protections : Short Circuit and overload at load,Reverse polarity of battery and panel, Reversecurrent flow from battery to panel, Battery highvoltage protection and lightning protection inpanel circuit. 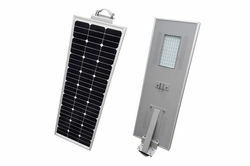 Light : 35 Watt Lamp Source : W-LED LED Make : Cree, Addison, Philips Solar Panel : 80 Watt(Polycrystalline)Battery : 30Ah(lithium-ion)Working Temperature : -10°C to + 55°C Duty Cycle/Operation : DUSK TO DAWN Light coverage : 120 Degree Rated Lamp life (Average) : 50,000 Hours Converter efficiency : > 90%Protections : Short Circuit and overload atload, Reverse polarity of battery and panel,Reverse current flow from battery to panel,Battery high voltage protection and lightning protection in panel circuit.